Qualifications: M. Sc. Marine Biology,University of Maine, Orono, ME, USA, 2011. B.Sc. Marine Sciences (Fisheries minor), University of Maine, Orono, ME, USA, 2008. NAUI Open Water Diver 2008, PADI Advance Open Water Diver 2010, PADI Rescue Diver 2010, PADI Dive Master 2017. After finishing my master’s degree I worked with an education-under-sail organization, Ocean Classroom Foundation as marine educator onboard US tall ships for school and college programmes. During that year I also wrote proposals with Dakshin Foundation for initiating researcher and community-based fisheries monitoring project in the Lakshadweep Islands. With original support from Rufford Foundation that project grew into a regional programme with the addition of new researchers allowing me to extend Dakshin’s interests in community-based monitoring to the recreational SCUBA diving industry of the Andaman Islands. With funding from PADI Foundation we initiated REEF LOG, a recreational diver-based reef monitoring programme in the Andaman Islands. 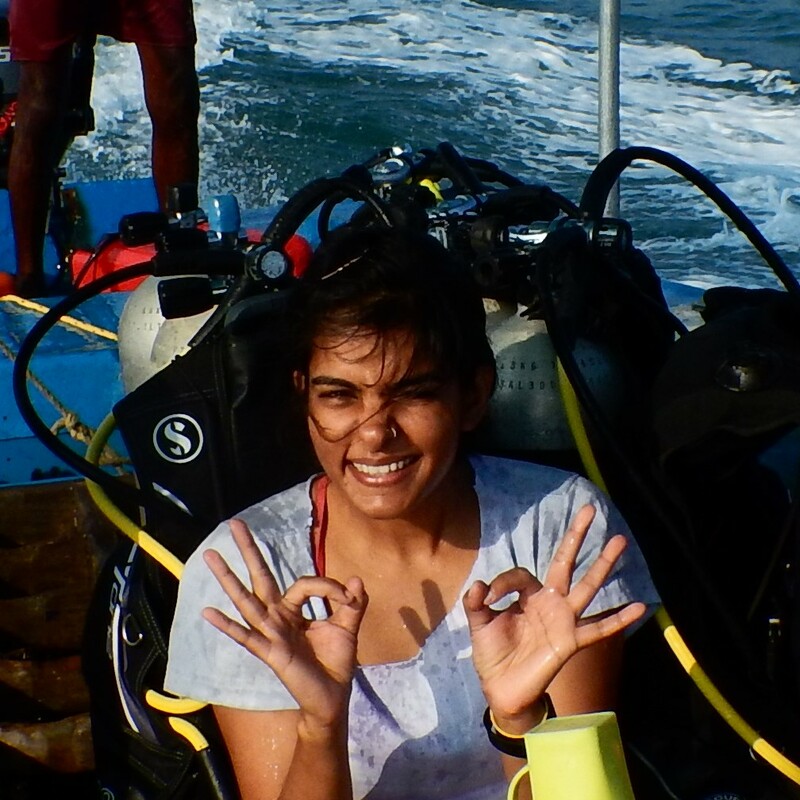 At the end of the 2016 summer, I took a brief break from Dakshin Foundation and rejoined in April 2017 as Marine Research Officer at ANET. My responsibilities at ANET have included development of base-related research, safety and ethics policies and protocols, coordinating research and higher-education programmes at ANET and assisting with base management. In the following months I will be initiating a new project to study dynamics of plankton communities in the Andaman Islands as part of a new grant Dakshin has received from GOI Department of Biotechnology. Jaini, M. and Hisham, J. 2013. Sustainable pole and line tuna fisheries in the Indian Ocean: Does Lakshadweep hold up to Maldives’ MSC standards? International conference on small-scale fisheries governance: Development for wellbeing and sustainability. Hosted by Centre for Economic and Social Studies, Hyderabad, India. December 10-13, 2013. 17 pp. Jaini, M. 2013. Sustainability of the Lakshadweep Pole and Line Tuna Fishery: Emerging challenges and changes. People In Conservation – Biodiversity Conservation and Livelihood Security. Vol. 5 (3): 11-12. Advani, S., Jaini,M., Oommen, M.A. and Sridhar, A. 2012. Taking it from the top: Managing apex predator fisheries in India. Position Paper for CBD-COP 11. Dakshin Foundation, Bengaluru and Foundation for Ecological Security, Anand. Wahle, R.A., Tshudy, D., Cobb, S.J., Factor, J. and Jaini, M. 2012. Infraorder Astacidea (Marine Lobsters). In, F.R. Schram & J. C. von Vaupel Klein (eds. ), Treatise on Zoology: Crustacea Decapoda, Vol. 9A. Brill, Leiden. Jaini, M. 2011. Interannual variability in American lobster settlement: Correlations with sea surface temperature, wind stress and river discharge. Masters Thesis, University of Maine, Orono, Maine. 66 pp. Jaini, M. 2009. Herbivory on Bonaire’s coral reefs. In: Steneck, R.S. & Arnold, S.N. (eds. ), Status and Trends of Bonaire’s Coral Reefs, 2009 and Need for Action. Report to the Bonaire National Marine Park (STINAPA). Jaini, M. 2008. Relationship between Research and Policy in the case of the Maine Green Sea Urchin (Strongylocentrotus droebachiensis) Fishery. Honors Thesis, University of Maine, Orono, Maine. 35pp.